Youtube users must have noticed the lack of download button in any corner of the Youtube page and thus knows that the major drawback of the site or app is its inability to download the video they want to. Many online Youtube downloader sites are available on the web for downloading these videos. One only has to copy and paste the link of that video present on Youtube in the designated space provided on the site. Also, limited formats are available to convert the video into desired formats. Keeping in mind of this downside many app developers have created various apps which help the user to download the videos into their system by directly opening the Youtube results of the searched video. Tubemate is one of the top ranking Android app used for downloading videos directly from Youtube. But now it is also made available on Windows as well as on the iOS after its initial success. First of all, the user has to type the name of the video to be searched into the search box. Then the app will show the result of your search. All the user had to do now is click on one result and select from the given formats such as MP4, 3GP, FLV, etc. to download the video into the respective format. Voila, after this the download will start instantly and will be ready to be watched without any interruption. As downloading a video is initiated quickly using the app, the downloading of the app itself takes several steps as it was mainly designed for the Android platform and thus an official version of the app is not available for windows. But by using an emulator one can easily download and run APK file on any version of Windows. An emulator in common is a hardware or software which helps in enabling a program to be used into another system other than the host system. The best emulator app which is used to run Tubemate .apk file on Windows is Bluestacks. Bluestacks is a major American technology company which designs its own App Player for enabling Android apps to be operated on windows. Here are the steps involved in downloading & configuring the Tubemate app using Bluestacks. First of all download, the Bluestacks emulator application software from its official site. Or else, you can try any of these emulators too if you’re not a big fan of Bluestacks. Install it on your system whether it’s XP, 7, 8 or Windows 10. Also, download an official APK version of Tubemate from the web. You can download it by using the following android” rel=”nofollow” target=”_blank”>link. Now open the downloaded APK file by going to its original file location on the computer and right clicking it. Choose the option of ‘open with Bluestacks’ from the menu menu which uses the already installed Bluestacks emulator software on the user’s PC Laptop Windows XP/7/8/8.1/10 to open the software successfully. Your Tubemate app is now ready to be used and explored. So, go ahead and download many as videos you want to watch as the app is only renowned for its downloading Youtube videos efficiently. Installation is completed, and the app is functioning properly. Now we are going to list some of the features which make the app more usable and exciting. First and foremost, the app is very much user-friendly as anyone using this app will have no trouble in learning the basic functioning of the software. It increases the number of downloads per day because if one person finds it attractive, then he will surely spread the word and thus the app will become a success. The second most promising feature of this app is its ability to resume download instantly if the download is affected due to network or speed problems. This feature is very helpful in saving the precious time of the users by not making them download the stopped or paused videos again and again. Also, contains a fast download mode. Users can save the downloaded file into named folder for the ease of access. Also, users can download files into mp3 format as well. The other supported video formats are 360p MP4, 720p MP4, 3GP (176 *144), 3GP (320*240), WEBM, FLV etc. Till now we have seen and analyzed every little feature and function involved in operating the Tubemate’s application. 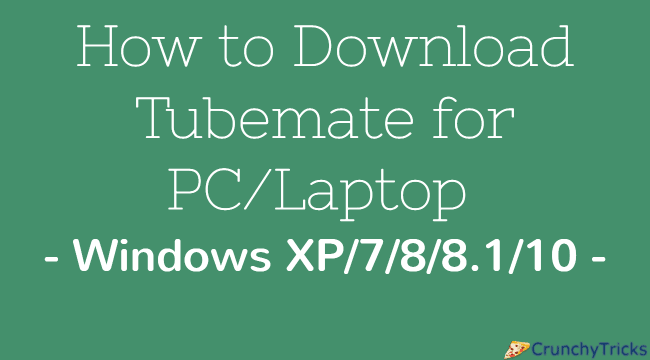 Hopefully, everyone reading this piece of information will find it very useful and will be able to carry out the exact steps required to download a video and .apk file of Tubemate. Now you can download as many videos you want for your collection or enjoyment. Share this knowledge and information easily with your friends and peers.